Pragmatic Play bring you this 5 reel, 3 row online slot, with 15 paylines. It’s a classically styled slot game that belongs firmly in the traditional category; like a physical slot machine adapted for the digital age. There’s a free spins bonus feature, along with an attractive jackpot game. Diamond Strike offers an RTP of 96.48%, and is available to play at UK Slot Games, where you can also play over 600 slot games, including ‘Starburst’, ‘Rainbow Riches’, ‘Fluffy Favourites’ and ‘Bonanza’. There are ‘classic style’ online slots, and then there are completely classic online slots. 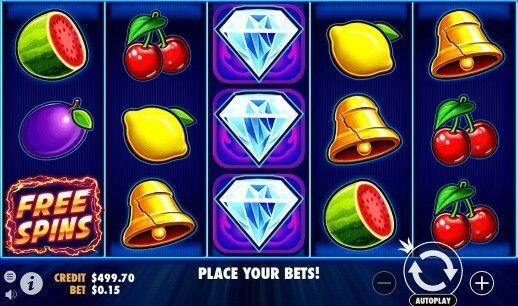 The slot game Diamond Strike, from Pragmatic Play, belongs to the latter category. This is a deliberate and conscious attempt by the developer to evoke the feeling of playing a physical slot machine in the corner of a bar, or an old fashioned arcade. It was released in 2017, but if you closed your eyes when you were playing it, it could be from thirty years ago. That feeling extends from the symbols right through to the sound, look and feel of the game. As the game loads, you can even hear the rattle and hum of a physical lot machine in the background, as if the gears of that engine were grinding somewhere behind your screen. The background is clean, sharp and uncomplicated, and the graphical style is basic but perfectly executed. Everything is in focus, and there are no distracting animations, changing backgrounds or flashing lights to put you off your game. This is slot gaming in its purest form. Even the soundtrack is something that you’d hear through the doors of and end-of-the-pier amusement arcade! If you’ve played physical slot games in the past; and we suspect all but the younger end of our readers have; you’ll be familiar with the symbols straight away. In fact, they’re probably like old friends to you, and if you’ve been playing more modern games you might not have seen them in a while! On the reels, we have lemons, plums, cherries and melons. It’s this theme that got fruit machines their name decades ago. Land any three, four or five in a combination and you’ll receive five, ten or forty coins. The bell symbol will bring you ten, twenty or one hundred coins, depending on how it lands; and of course lucky number seven is here as well, in red. Three, for or five of the lucky number seven symbol will bring a reward of ten, twenty or two hundred coins. This should all sound comfortable and familiar so far. The game is called Diamond Strike for a reason of course; and that’s the presence of the sparkling diamond symbol, which is your wild. That replaces everything other than the free spins and scatter symbols (represented by a golden seven with diamonds at its foot), and can bring you winnings of up to three hundred coins for every payline. As you might already have expected from a game that takes solid inspiration from the slot games of the past, the bonus features in Diamond Strike aren’t expansive or complicated. The two features it does offer work well, and complement the old-school feel of the game. 1. Free Spins: Free spins do exactly what want them to do. They’re not easy to obtain; not only do you need to find three ‘free spins’ symbols to trigger the game, but they have to appear on reels one, three and five. They trigger eight free spins, which doesn’t sound like a lot, but there’s a twist; the game adds many extra wild diamond symbols to the reels for the extent of the free spins, which should boost your winnings. Also, if the free spins symbols turn up again during the feature, they’re re-triggered. This can go in indefinitely. 2. Jackpot Bonus: Diamond Strike Jackpot Bonus is the feature that gives you access to potentially larger wins. If the golden 7 symbol appears anywhere on the reels in numbers of three or more, you’ll hear someone who sounds like an old fashioned game-show host shout ‘Diamond Strike!’, and the screen will change to a grid made up entirely of diamonds; twelve of them to be precise. You have free choice of any of them, and you just keep picking until you’ve uncovered three that match. The Mini Jackpot pays out ten times your bet; the Minor pays out at a multiplier of thirty, and the Major offers a full hundred times whatever your stake is. The game’s not done there though; if you can find the Mega symbol three times, your initial stake is multiplied by one thousand. A quick look at the gaming portfolio of Pragmatic Play, who were founded in 2007, tells you that they’re a design company with a theme; all of their games have a definite visual feel to them, and many of them use the old West as a setting. They have over 100 games on their roster, the highlights of which include Wolf Gold, Gold Rush, da Vinci’s Treasure, Great Rhino, Madame Destiny and Peking Luck. The company themselves are big players in the iGaming sector, creating not just online slots but also bingo, live casino games and digital scratchcards. All of their games are entirely developed in house, and they advertise themselves as having a ‘mobile first’ mindset; this is a company who are very much aware that more and more gamers are turning to the mobile format of games, and so they design with the mobile experience first in their minds, and the laptop experience second. That could well be the way of the future. Those with a technical mindset might be interested to know that they exclusively use HTML5 to code their games, which is a versatile language and means that their games should work seamlessly across any platform. The company’s manta is ‘innovation and dedication’, and they pledge two release two new titles every month without fail, which is a prolific output in the modern age. Pragmatic Play can point to the fact that they have customers in 80 different countries as evidence that they’re truly a global company. They don’t apply a great deal of text to any of their games; they’re a company who prefer to let their products do the talking for them. The quality of Diamond Strike does that talking perfectly. It’s modern enough to appeal to people who like the 21st century style of gaming, and yet at the same time it’s got a classic and traditional quality that also makes it attractive to people who’d still like to be playing slot games in the corner of their favourite pub. Obviously, there are plenty of games out there who like to use diamonds as either an attraction, or the focal point of the game. That means there are several slot games out there which are similar in nature to Diamond Strike. The first place we look when we’re assessing similar or related games is to the development team who made the game we’re reviewing, and in this case, Pragmatic Play do have a couple more diamond themed offerings, one of which is directly related to Diamond Strike. Diamond Strike Scratchcard: This is a sure sign that Diamond Strike is doing well for Pragmatic Play; they only make scratchcard variants of their most popular games. Given that Diamond Strike has only been available since 2017, it must have covered a lot of ground in a short space of time to become available on online scratchcard format. Of the game there really isn’t much to say; it takes the sounds and sights of Diamond Strike, puts them on a virtual scratchcard, and invites you to scratch them off to find three matching prizes. The top prize the game offers is £100,000. It’s not an online slot game, just a game inspired by an online slot. Diamonds Are Forever Three Lines: This is a cheeky attempt by Pragmatic Play to riff off a James Bond film, without actually using the James Bond licence! Even their own description of the game invites you to ‘feel like James Bond’ as you attempt to take the jackpot out of the machine and impress Miss Moneypenny. We didn’t know Bond and Moneypenny were that close! This is an even closer representation of an old-school slot game than Diamond Strike is; so much so that it’s just three reels, and three paylines. It will only truly appeal to those who are or were fans of one-armed-bandit machines, but if you are a fan of that genre, then this game was made for you. It has an RTP of 96.96%, with low volatility, and a maximum jackpot of around £30,000. Due to the sheer number of diamond-inspired games, along with the number of games which are geared to appeal to traditional players, it’s difficult to point at another game and say that it’s either a clone or a copy of Diamond Strike. Games based around diamond symbols have been around for decades before Diamond Strike was released, and they’ll be around decades from now instead. There are many online slots which operate on a similar theme to Diamond Strike, and instead of calling them direct clones or copies, we’ll just say that they have a lot in common with the game, and offer our thoughts on what makes them unique. Microgaming must have seen what Pragmatic Play were trying to do with Diamond Strike, and decided that they could take the slot game even closer to its roots. Using several of the same symbols as Diamond Strike, Diamond Deal is a three reel slot game that has a lot in common, in terms of its visual style, with the Diamonds Are Forever game that Pragmatic Play also offer. Incredibly, there is only one fixed payline; this is as basic as basic games get. The RTP is 89%, which is on the low side too. Much like Diamonds Are Forever, this game was created for fans of the old fashioned way of playing. There must be something about diamonds that just makes people want to produce traditional games. Diamond Empire is another game from Microgaming, and another three reel, traditional offering. This one has a little more sizzle than Diamond Deal, though; there’s a jaunty soundtrack in the background, and a bonus round that takes you through to a wheel of fortune, where you can land a number of very nice multipliers to your original bet. Fifteen paylines give it a more modern payout potential than it may originally appear to have, and an RTP of 95.8% makes it more attractive still. That being said, it doesn’t have the dynamic feel or sleek looks of Diamond Strike. Someone on the design team at Microgaming has a real thing for diamond themed games; this is yet another entry from them; although in fairness it was a joint venture with a younger company called Just For The Win, who were established in 2016. Graphically, this is a unique twist on the classic style; the symbols on the reels are fruit, but they’re modern 3D renderings of fruit. It’s not visually outstanding, but it does set it apart from some of the other traditional style slots. Free spins and a wheel of fortune as bonus features aren’t anything to write home about, but they’re solid enough, and the 96.3% RTP is generous, too. On the slightly stranger end of the market, there’s IGT’s ‘Da Vinci Diamonds’. The diamond is still the star of the show in this game, but the Mona Lisa is on the reels as well, and so his her creator Leonardo da Vinci. This is about as high-brow and cultured as online slots get! There are gemstones making up low-value symbols, and the remainder are various portraits by da Vinci, with a solid diamond being the most valuable of all. We don’t know what was happening in the IGT offices when someone thought this game up, but we like it. There are twenty paylines, an RTP of 94.94%, some bonus features including free spins and cascading reels, and of course a lot of great artwork to look at. What’s not to like? It’s not as basic and clean as Diamond Strike, but then art is never supposed to be basic. You would expect that a game that was not only released within the last couple of years, but released by a company that openly prides itself on designing online slots that are perfectly functional on smartphones, would appear flawless on a smartphone. And of course it does. Nothing of the game is lost at all; the rumble of the ‘mechanism’ behind the slot, the atmospheric soundtrack and the clean sharp reels are all here, just as they are on the desktop version. The game optimises and rearranges its layout depending on whether you have your phone in portrait or landscape mode, and it doesn’t shrink the playing area in order to do so, which a lot of mobile versions of games do. All the buttons are nicely proportioned for your fingers, and everything is easy to find. You can even activate turbo spin by holding your thumb down on the spin button. We can’t speak positively enough about the mobile version of Diamond Strike. This is the standard that all developers should aspire to when they’re trying to make their games workable for mobile gamers. It might even be better than playing it on a desktop. Pragmatic Play say that their philosophy is ‘mobile first’ when they’re designing new games. Based on this evidence, they’re right. As you’ll know by now if you’ve been following this review, Pragmatic Play have a reputation for creating quality games. That means whenever they release a new one, publications from within the industry are often on hand to play test it and give their thoughts. That was certainly the case with Diamond Strike, and as it was released comparatively recently, some of the reports that came out at the time of its release are still available online. Casinopedia is an independent website that likes to act as a hub of information for the gaming industry as a whole, and took the time to record their thoughts when the game was first released. As you can see from their glowing words, they were impressed by the game and thought it had the potential for longevity. Given that it’s as popular now as it was when it was first released, it’s difficult to argue with that point of view. Online Casino Reports, another independent website who provide reviews and information about the industry, were excited by the release of Diamond Strike, too. In fact, they went on to call the free spins feature ‘The Diamond Standard of Free Spins’. We know they were making a play on words, but it really is an excellent free spin mode, so they have a point. Why Is UK Slot Games The Best Place To Play Diamond Strike? Do you suddenly find you have the urge to go diamond hunting yourself? After reading all of that, we’re not surprised! There’s a lot to be said for a fantastically well made, traditional slot game. That’s exactly what Diamond Strike is, and that’s why so many people enjoy playing it. Don’t forget that we also play host to several games like it, too. If you want to play Diamond Strike, we’d love you to stay here and do it on ukslotgames.com. We think we’ve got the right package available as a slot game website to give you the best playing experience. Not every online slot website is equal. There are some great ones out there, and some terrible ones too. We’re of the opinion that we’re one of the great ones, and here are the reasons why. For a start, we have a hugely extensive range of slot games that the vast majority of websites could never hope to get near; we have over 600 popular slot games available for you play, and they’re a carefully curated selection based on quality and fun. We have a range of different themes, and games of different difficulty, that should appeal to the new player and the experienced gamer alike. If you’re bored of playing your usual slot game, there’s always a new one for you to find on UK Slot Games. Secondly, we don’t force you to deposit money when you first sign up. Everybody is welcome to make an account, and you can then browse our entire catalog to find a game you really want to play before you hand over any money. Diamond Strike is a fine place to start, but there’s no reason to stop there! In fact, we do the opposite of forcing you to hand over money. When you sign up, you could win up to 500 free spins on our games just for doing so! We like to keep giving you free spins, too. Every time you deposit £20 or more through our safe, secure PayPal processing method, you’re eligible to win more free spins. On top of that, our players can receive up to 10% as a daily cash back incentive! We’re a friendly company who genuinely appreciates your custom, and want you to enjoy spending time with us. We’re always looking for new ways to reward regular players and thank you for choosing us. A genuinely great product range with genuinely great incentives should mean happy customers; so in that way, you can consider it our job to make you happy. Come on in and let us show you!